Aloe Vera is a fantastic houseplant. It looks cool, is easy to care for, and it creates a gel that is super useful for skincare. If you’ve owned an aloe plant for a while, you’re probably wondering about what the procedure is to repot your plant or even propagate it. 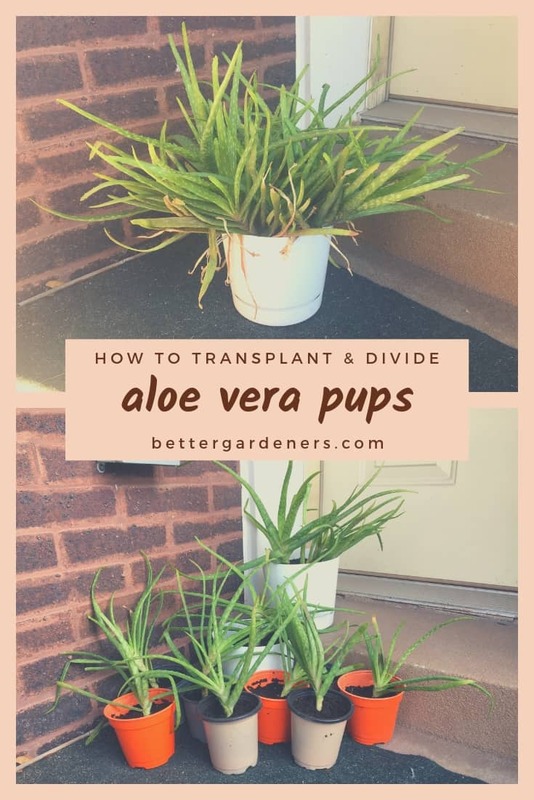 This article covers everything you need to know to transplant your aloe vera plant and cut off the pups to grow new plants. Aloe is a cool plant that reproduces two ways. Aloe is a flowering plant, so it reproduces sexually. Once one of the flowers is pollinated, it produces seeds. Those seeds can then be planted to grow a new plant. Aloe also reproduces asexually by producing offsets or pups. These are small plants that grow from the base of the parent plant. Over time, more and more pups will grow. As a plant owner, you can separate these offsets to grow new aloe plants. It’s rare for aloe kept as houseplants to flower. If you have an aloe plant, it’s likely you’ll be able to propagate it by separating the pups from the parent plant. Once you’ve had your aloe plant for a few years, you will notice baby aloes growing at the base. The offsets will need to be at least four inches tall before you consider dividing them from the parent plant. This process is going to be a little messy, so you may want to do it outdoors or use a potting bench or tray to help control the soil. Slide the plant from the pot (you may need to use a trowel or hori hori knife to loosen the plant). Make sure to primarily handle the aloe by the root ball to avoid damaging the plant. 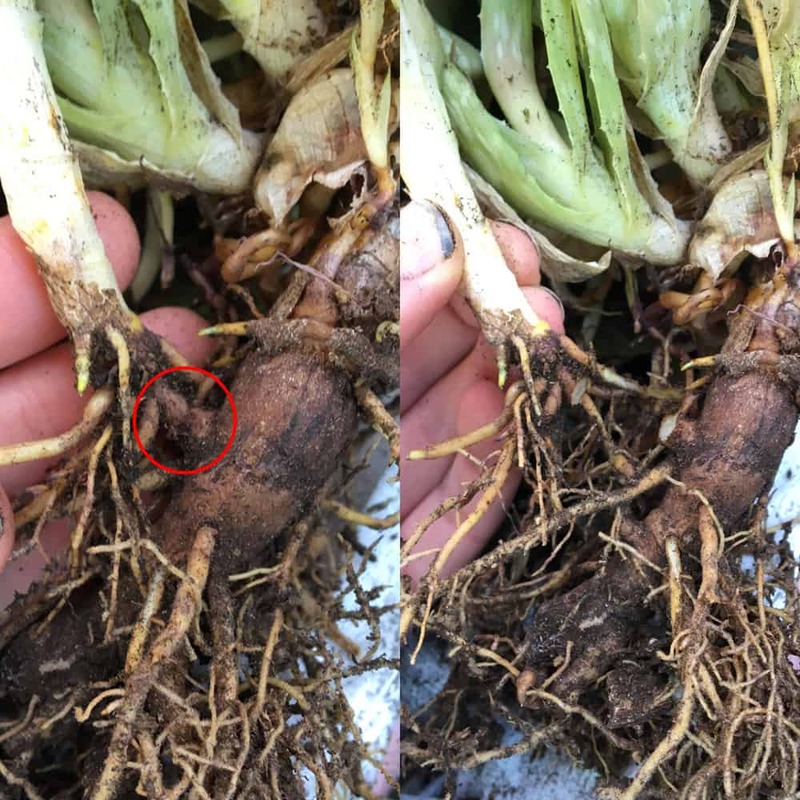 Gently work the root ball with your hands to remove as much of the soil as possible. 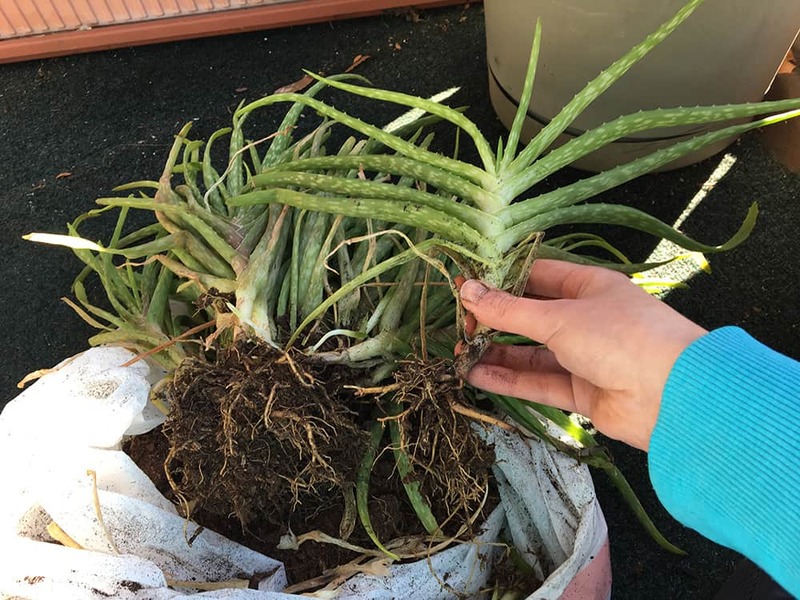 Some of the aloe pups may fall away during this process. Once you remove excess soil and any loose pups, examine the roots of your aloe plant. Isolate a baby and try to gently remove it from the parent. If it’s firmly attached, use a sharp clean knife (a non-serrated kitchen knife works great) and cut the pup off the parent. See the photos below that show where to cut. Examine your aloe pups. As long as they have some roots attached, they will grow once replanted. Any offset without roots can be composted or used for its aloe gel. Allow the parents and pups to “rest.” They need at least 24 hours (or up to six days) to allow their wounds to heal. The wounds will dry and callous over. Lay them out flat in a cool, dry, place away from direct sunlight. Whether you’re transplanting your aloe whole into a larger pot or planting your new pups, it’s the same process. Aloe plants benefit from being repotted with fresh soil or compost every year or two. Select a pot or container with good drainage. For pups, plant them in a 4″ diameter pot. For a growing medium, either buy a good cactus mix or you can take your own compost or a regular potting soil and mix it 2 parts soil and 1 part perlite to create a well-draining mix. Add 1-2″ of soil to the pot and then gently place your aloe plant inside. If needed, add more soil to the bottom of the pot so the base of the plant aligns with the lip of the pot. Fill the pot with more soil up to the point on the plant that was under the soil originally. Place your aloe plants in a sunny spot (they like a lot of sun!). Wait for three days before you water them and then only water again when the soil is dry.